Everything in interior design has a life-cycle – I mean EVERYTHING! Back in the day, decorative treatments were on every window in our homes – even the ones that didn’t need them. So whatever happened to our mother’s beloved draperies? 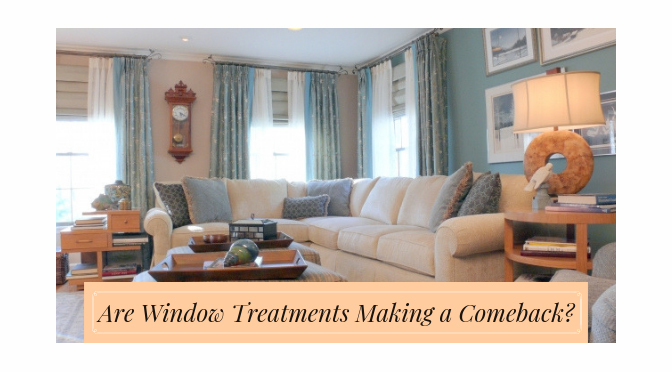 For a few years now window treatments had been deemed unnecessary – even to the point where many clients were afraid to have anything on their windows at all. But finally, the stigmatism against decorative window elements as started to lift and they are making a comeback. Side panels, valances, cornices, blinds, shutters, and shades are and can be an aesthetic AND practical addition to any room. What is the treatment supposed to “do”? Gone are the days of heavy swags and jabots blocking beautiful natural light AND views. However, that doesn’t mean windows need to feel naked. When designing a successful window treatment you need a goal. Whether that means gaining privacy, adding color, texture, or pattern to a space, or making a space and window feel taller, wider or warmer – figure out what needs to be achieved and why. It’s more than just picking a fabric that you like – make sure you are addressing your goals! Don’t just settle for in-stock or online. On the surface, it may seem that the array of fabric selections are endless but you need a good eye to make sure they work with your decor. This is where a professional comes in handy to guide you to what’s best for you and your home. In reference to size, opt for longer curtains for a more elegant look, or shorter curtains for a cleaner, crisper look. Finding just the right fabric and length in-stock in a store or online is a daunting task –but don’t just settle – a window treatment can make a break a room! Functionality – Yes, they can have a purpose. Don’t forget that soft (curtains) and hard (shades) window treatments can have a purpose. For instance, drapery side panels can assist with your home’s heating and cooling. Putting up heavier curtains or drapes can help to cut down on this wasted energy along with saving you some money. If you live in a city or busy area like myself, curtains and shades can also help with cutting down outside noise. Make your window treatments work for you! Like any other element of interior design, window treatments are an integral part of a great space. Take the time to check out all your options making sure that they accomplish your goals and functionally answer your needs! Sound complicated? Then ask a professional, like me, what window treatments would be the perfect fit in your home! Carrie Oesmann is the ASID, CAPS and AKBD certified Interior Designer of Bailiwick Interior Design, a business she has owned and operated in New Jersey since 1999. Last year she had the pleasure of expanding her business and relocating to the Lehigh Valley, so she now lives in downtown historic Bethlehem with her husband John. Her “Journey to Bethlehem” inspired her to start sharing her adventure on her blog, which you can find on her website, www.bailiwickinteriordesign.com. You can also follow her on Facebook. Carrie’s home also doubles as Bailiwick Interior Design’s Pennsylvania office and unique lifestyle showroom, a place where her clients can experience a variety of options in a real home—it’s unlike anything we have seen in the Valley! Call Carrie for a personal tour of the lifestyle showroom.